Other than the usual, he’s kind and loving, I couldn’t live without him and he pretends I’m not hard to live with – there are definitely times when things happen that make me sit back and go “AND THAT’S WHY WE ARE MARRIED”. Ben had made me promise not buy any more “unnecessary” stuff. And I did. 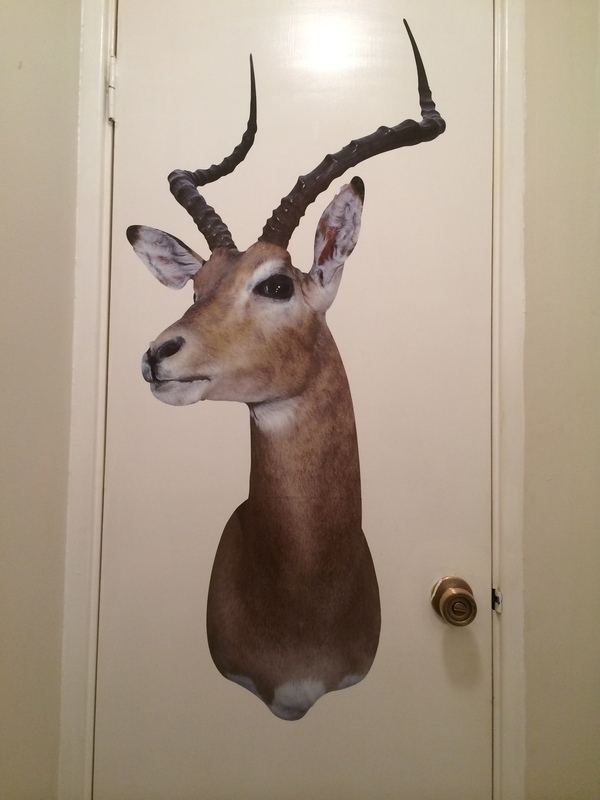 But I think we can all agree that a LIFE SIZE ANTELOPE HEAD STICKER for the toilet door is hardly unnecessary. That day I got home and confessed that maybe I’d broken my promise a little bit. I showed Ben the picture of the antelope sticker I had ordered. He said “That’s not unnecessary, that’s AWESOME”. And that right there is why we are married. Our oven had started to turn itself off mid-cooking. We decided we probably had to buy a new one. A few days later I said to him “Instead of buying an oven, let’s spend the money on building a giant fort in the backyard” and instead of saying “but we need an oven” he said “that’s a great idea, let’s get the fort”. I always thought I was pretty antisocial. 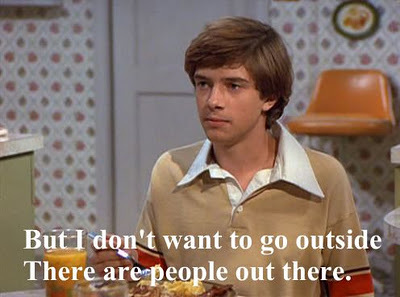 Not in a terrible, can’t relate to people way, more in an “I would be much happier if people wouldn’t invite me out anywhere and I could sit in my house and read a book in my pyjamas” way. I refuse to go out on Friday nights – I’ve told people that once I put my pyjamas on, I won’t get dressed again and leave the house. They clearly don’t realise I put my pyjamas on the minute I walk in the door from work. Mostly for that very reason. “Oh, really? That sounds lovely and I am tempted, but I’ve already got my pyjamas on”. I have also been known to act like I’ve won the lottery when an event has been suddenly cancelled. But if I’m considered quite good at antisocialism (is that a word?) then Ben almost treats it like an Olympic sport. 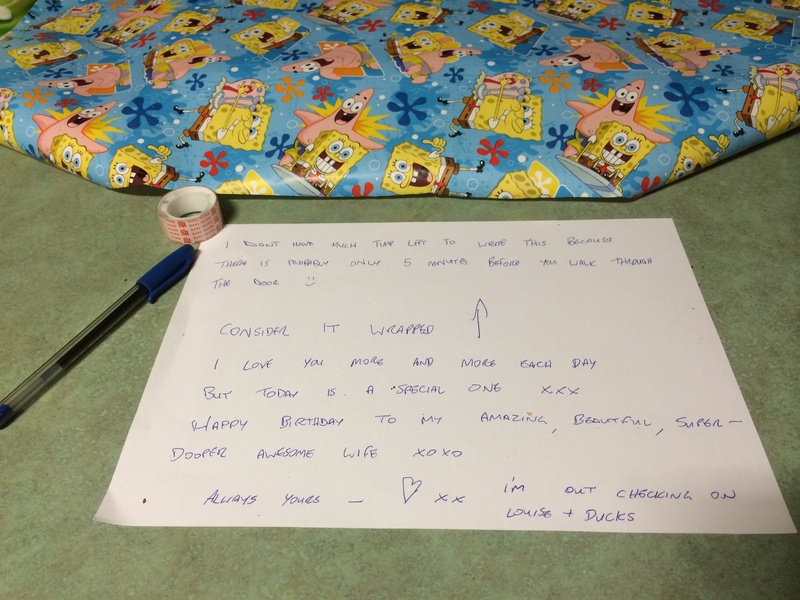 Last year, coming up to his birthday, I asked him if he’d like to have a birthday party. He sighed and tutted and flopped around, eventually saying “I GUESS SO. I mean, I suppose I HAVE to do something….” And then asked whether we could put a start and END time on the party invitation. He said he’d seen invitations like that before, “you know, like: 2pm-4pm”. I told him that was for childrens’ parties. He said that was fine, we didn’t have to put an end time on, he’d just tell “all the freeloaders” (aka friends) to sod off after a few hours. We’re married because, we’ll, imagine being married to one of us if you were a social butterfly.. Fortunately, or unfortunately, depending on who you are, it does mean we can sit and agree with each other that the rest of the world are a bunch of crazy stalkers and we “we have to go home to feed the ducks” are the normal ones. Funnily enough, when we do actually go somewhere or have people over, we tend to have a pretty good time. Don’t tell anyone though, they might invite us somewhere. When I told him our robotic vacuum cleaner was named Rosie, he immediately, and will forevermore, remember to refer to her as “she” and never “it”. He’s also been known to ask her how she is going when she’s cleaning and whether she has had a good day. I’ve actually noticed he is quite a bit nicer to Rosie than the cat. Probably because Rosie has only taken a dump on the floor once. 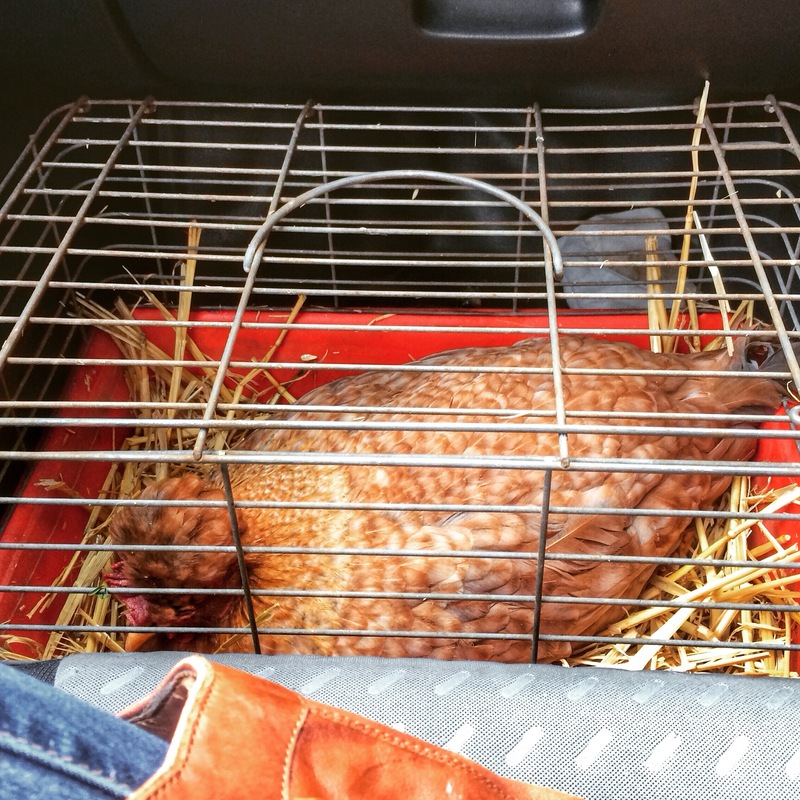 Shortly after we got our first lot of chickens, one of them got sick. I was at work when he called me and said she was making a strange noise. I instructed him to take her to the vet. He packed her into a cat cage and sat at the vet office, a muscly tattooed man, among all the people with big dogs, with a chicken in a cage on his lap. Since that time, he doesn’t bat an eyelid at announcing to the vet we have bought in Thelma or Hairstyle for their appointment. I don’t have much time left to write this because there is probably only 5 minutes before you walk through the door. I nearly cried. Because it was so perfect. We don’t really do arguments (I suspect because I will win them all and Ben won’t find that very fun, besides, arguments take up valuable time when you could be doing something constructive, like watching 30 episodes back to back of Law and Order) So whenever we get frustrated at something each other has done, and start to get snarky about it, a completely acceptable response is for the other person to silently look deadpan at the snarky one and say “You get in the bowl”. Then the other can reply “ NO, YOU get in the bowl”. This ends all arguments before they even start, because there is no response to that, other than to keep yelling “ NO, YOU GET IN THE BOWL” at louder and louder intervals, and that would be ridiculous. We are married because our house makes no sense, and that makes perfect sense to both of us. Yesterday morning we discussed two important issues: What we’re going to do when Norris gets into parliament and why the spider, who caused my car accident, won’t pay for my insurance excess. We’re quite confident that Duck Norris could win the election (although there’s a chance he’ll get distracted by his harem of women and forget to enter) so we discussed how he will handle press conferences. Since he is an expert at avoiding questions, and will only respond with “Braaaap” and some sort of muttering, coupled with the fact that he resorts to kicking anyone who doesn’t agree with him, we think he’ll fit into Australian politics seamlessly. I crashed my car last week because a spider ran across my leg. I had already told the insurance company that since it wasn’t technically my fault, I thought they should chase the spider for the excess payable. The insurance company told me I’d have to present the spider for questioning. I told Ben at breakfast that I was very disappointed that the spider had shirked it’s responsibilities and I was of the opinion that it should get a job and pay it off. He said maybe the spider had fallen on hard times, did I think about that?? And I had to admit that no, I was really only thinking about myself.